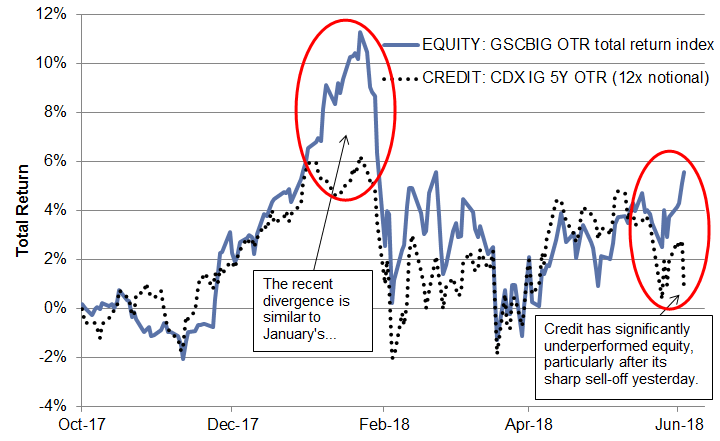 It's deja vu all over again in the US (and European) capital markets as credit markets have dramatically diverged weaker (as stocks extended gains, ignoring every risk that is thrown at them), just as we saw in January, before the February reality check... and Goldman is worried. Over the past month, US Investment Grade credit has steadily underperformed its corresponding equities, punctuated by a significant credit widening yesterday. Despite CDX IG 5Y widening 3bps yesterday afternoon to 67bps, there was little SPX reaction and only a modest rise in the VIX. We estimate the equities corresponding to the names in the CDX IG Series 30 are up 3.5% in the past month while a risk equivalent investment in CDX IG 5Y is down 2.8% (selling protection at 12x hedge ratio). Relative to volatility over the past year, credit has underperformed equity by 3.1 standard deviations over the past 2, 4, 6 and 8 weeks when compared to these same rolling periods over the past year. This compares to a 2.7 standard deviation dislocation when we last wrote about a similar divergence in January. What might this mean for forward equity returns? Over the past year, when credit has underperformed equity by an average of 1 standard deviation over a 2, 4, 6 and 8 week period (12% of observations), equity was down an average of -2.3% over the subsequent month. When credit OUTperformed equity by more than 1 standard deviation over a 2, 4, 6 and 8 week period on average (8% of observations), equity was up an average of 2.4% over the subsequent month. We see this difference as significant and leads us to favor de-risking strategies in equities. And it's not just US markets. 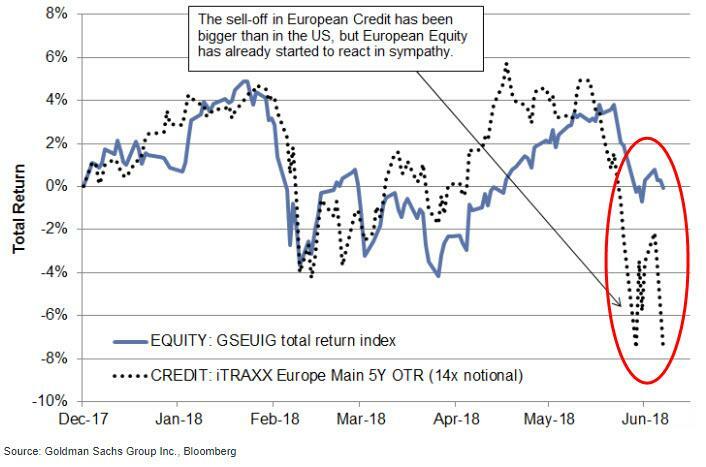 While there has been a similar divergence in credit and equity in Europe (exhibit below), the divergence is less notable in our opinion because European equity has traded down on an absolute basis. This suggests European equity investors are already focused on the risk and the debate is about magnitude rather than direction. US equity investors are, in contrast, bidding up stocks despite this growing international concern. Simply put, there is a higher potential for equity investors to recognize European issues as a threat to global growth than for US credit investors to shrug off European risks as irrelevant for US companies.